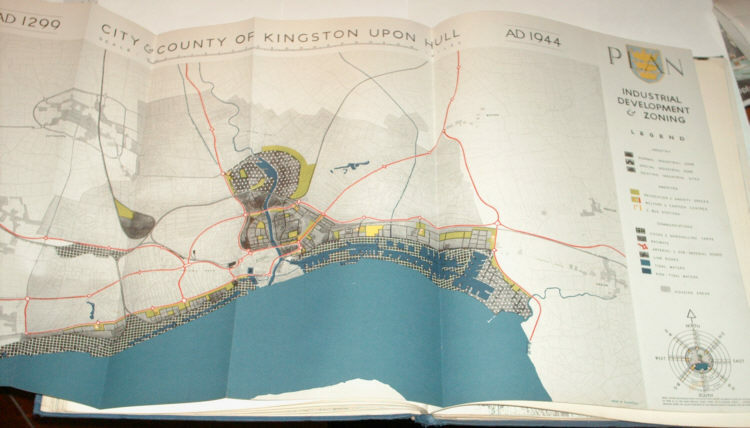 Lutyens, Edwin; Abercrombie, Patrick: A Plan for the City & County of Kingston Upon Hull. 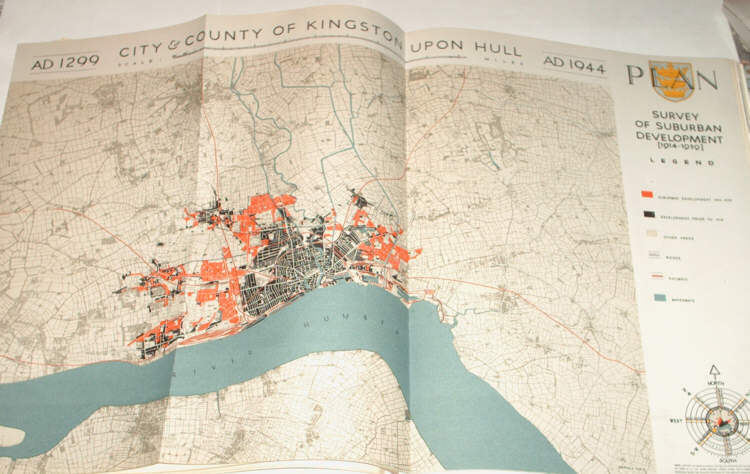 London & Hull: A. Brown & Sons, Ltd. 1945. 36 cm, oprawa twarda płótno oryg., XII, 92 p., 46 pp. of plates. Hardcover, no dj, blue cloth. Very Good. Stan lepiej niż bardzo dobry. Masa egz. 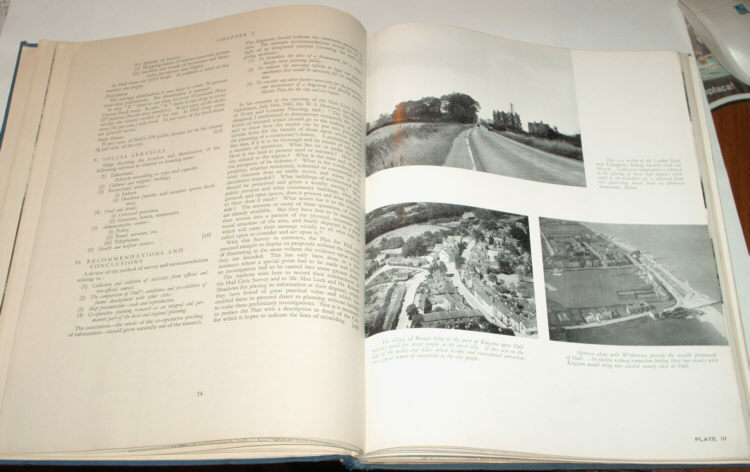 : 1600 g.
Profusely illustrated throughout with maps, plans, artists' impressions, diagrams etc. : pictorial e.p. 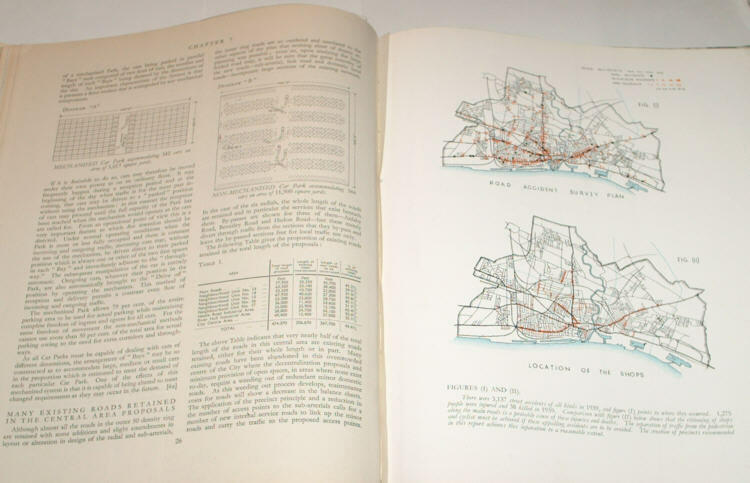 's, 13 large folding coloured maps (relating to road & rail links,industrial & suburban development, land utilisation, population distribution etc. ), + over 50 other ills. 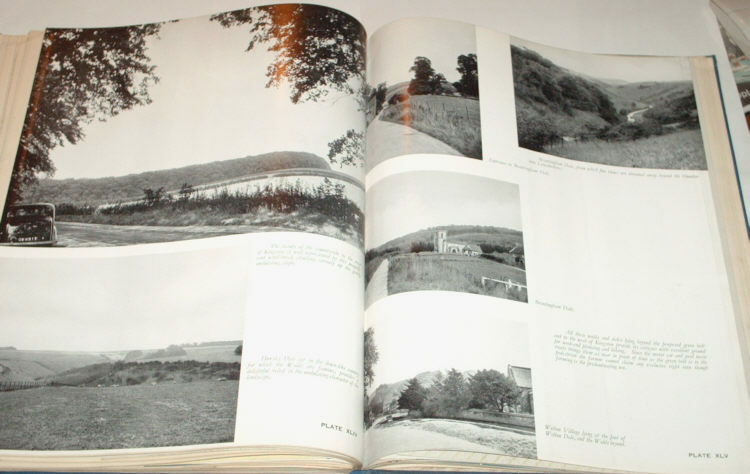 including b/w photos & full page colour illustrations. Forward by Alderman J. L. Schultz O.B.E. 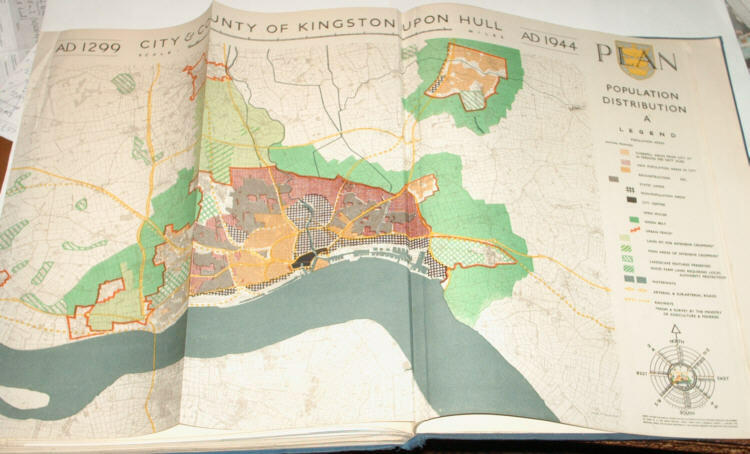 When the fury of an enemy's assault was loosed upon our City and we saw our heritage shattered under the weight of air attack, the spirit of the people of Kingston upon Hull was unbroken. The heroism of the ordinary citizen under an incessant bombardment earned the admiration of all who were privileged to pierce the anonymity of this "North East Coast Town". We resolved that the only fitting tribute that could be paid to the devotion and courage of a brave people was to rebuild our City in a manner worthy of it citizens. Out of the ashes of the old would arise Phoenix-like a fairer and nobler City than we had ever known. 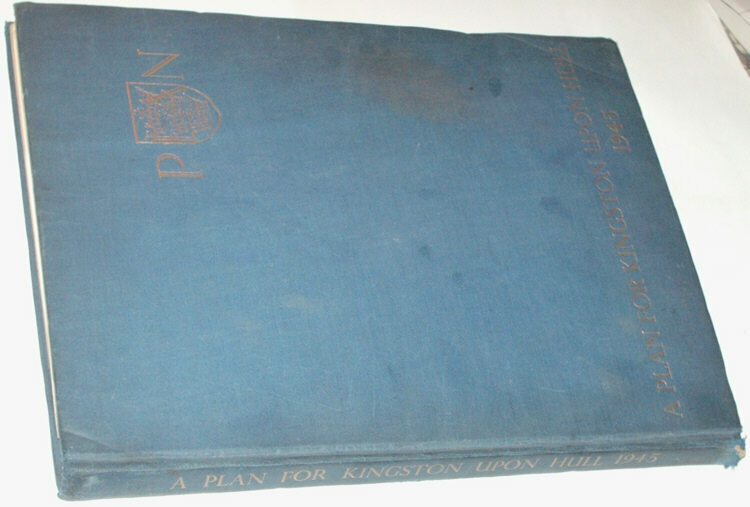 Accordingly the services of two great town planners, the late Sir Edwin Lutyens and Sir Patrick Abercrombie, were secured to draw up a plan for a City worthy of its citizens. This is the plan. 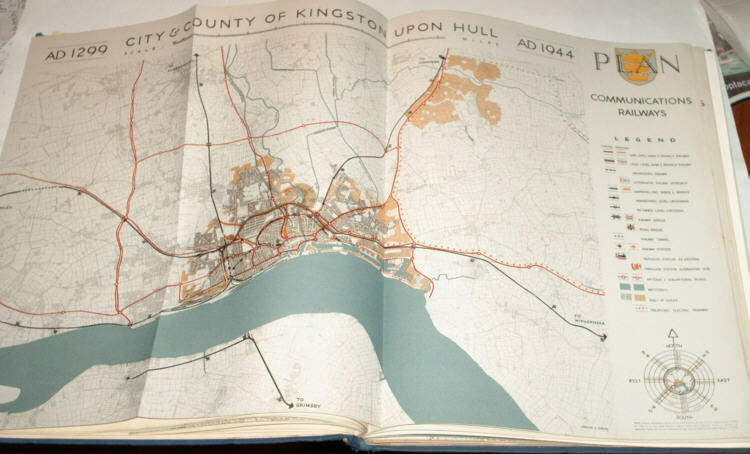 It is put forward as a guide to the citizens for the future development of our great City. It is theirs to discuss, to consider, to criticize, to amend and to adopt such of it as they consider to be proper. Let the discussion be intelligent, their consideration enthusiastic, their ciritcism constructive, their amendments wise, so that the adopted plan may be an inspiring contribution to town planning and a fitting tribute to a great people. Few of us will see the completion of the plan. But may we point out the road to destiny that will be not unworthy of the great victory that the heroism and faith of our people has helped us to secure. So let us face our task of Reconstruction with hope and courage. 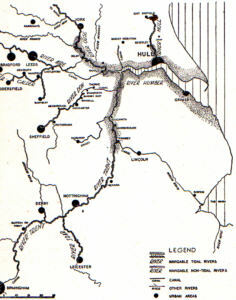 Our Geographical position which as made us the Port of Yorkshire and the Midlands also made us the natural target in a Continental assault of War. The same Geographical situation can and will make us the portal to England from the European Continent for the ships and planes of the era of Peace and Prosperity which we hope has dawned. May we build a noble gateway that will be a credit to our day and generation.